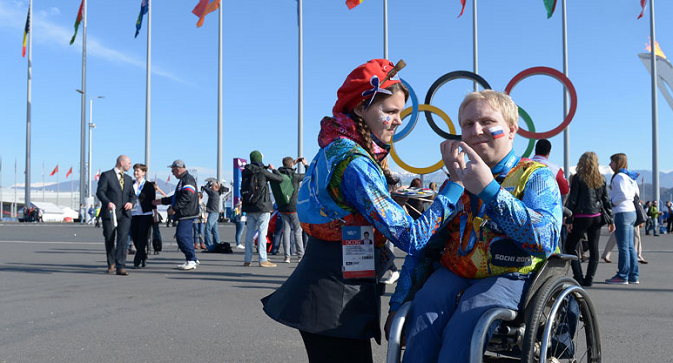 Disabled athletes from all over the world have arrived in Sochi for the 11th Paralympic Games. Though some have expressed fears of a boycott over events in Ukraine, organizers remain optimistic. The 11th Winter Paralympic Games will start in Sochi on March 7, and will last until March 16. The Russian national team at the 2014 Games will include some 70 athletes who have either a physical or a visual impairment. Russia will compete in all the events: biathlon and cross-country skiing, alpine skiing and snowboard, ice sledge hockey, and wheelchair curling. The Paralympic Villages are now ready to welcome the athletes and members of national delegations. The two villages - one on the coast and the other up in the mountains - will accommodate representatives of 45 countries for the duration of the Games: some 1,600 athletes and members of delegations in total. Nearly 2,000 staff and volunteers will ensure that the visitors' stay is untroubled. The Paralympic Villages have everything necessary to make life comfortable for the disabled athletes: ramps, handicapped accessible shower rooms, low basins and switches, automatic doors in corridors, as well as elevators with voice recognition and special buttons. The coastal Paralympic Village, called Usadba, can accommodate 350 people. Its mayor is two-time Paralympic champion and world record holder in swimming Olesya Vladykina. The village is located in close proximity to the Coastal Cluster venues, so it will take athletes no more than 10 minutes to get to training and competition venues. Usadba will be housing athletes participating in the ice sledge hockey and wheelchair curling competitions. The mayor of the Paralympic Village in the Mountain Cluster is six-time Paralympic champion, seven-time world champion and four-time European champion in skiing Sergei Shilov. The village will house athletes competing in cross-country skiing, biathlon and alpine skiing. The Mountain Village is located near the ski center and snowboard park at an altitude of 1,100 meters. The distance to the competition venues at the mountain cluster is about 10 kilometers. Transportation will be available around the clock within the village and from the village to competition venues. In addition, athletes and delegation members will be able to take advantage of the two Rosa Khutor cable-car stations, which are located within walking distance of the Mountain Village. The Paralympics cultural program planned by the organizers promises a wealth of originality and variety. Theater festivals, performances by the winners of Russian arts contests and appearances by Russian and international stars will make for an exciting finale to the Sochi 2014 Cultural Olympiad (a celebration of culture that lasted for four years preceding the Games). Attendees to the White Stick – Paralympic Games concert on March 16 will have a unique opportunity to hear the legendary Jose Carreras live. On March 1, a landmark event took place in the British village of Stoke Mandeville, in the county of Buckinghamshire, where the inaugural Heritage Flame was lit in the first ever international leg of the Paralympic Torch Relay. Following a decision by the International Paralympic Committee, from March 2014 Stoke Mandeville, which is considered to be the birthplace of the Paralympic Movement, will be a mandatory part of the itinerary of all Paralympic Torch Relays. After the cauldron was lit and the Paralympic anthem performed, the flame was symbolically transferred from the UK to Russia to be united with sparks from other Russian cities involved in the Torch Relay. The only fear the organizing committee has is the prospect of a boycott of the Paralympics over the situation in Ukraine, where Russian troops have taken control of the Crimean Peninsula. So far, however, these fears remain unfounded. On Sunday, March 2, Polish Prime Minister Donald Tusk urged athletes not to refuse to take part in the Games. According to him, "a boycott of the Games would in no way help to resolve problems in Ukraine". RIA Novosti quoted Tusk as saying: "I shall be frank, I don't think that our Paralympians' refusal to take part would have an effect on what will be happening in Crimea or in Ukraine."